This is my first post in this forum so let me start by saying that since I first discovered this excellent site a few months ago, I have found it to be an invaluable reference point for both sword design and construction techniques. I have been lurking on these forums for a while and inspired by Todd Owe's post I have decided to brave posting, for your comment, some images of various pieces I have made. I live in Sydney Australia and first became interested in making swords and armor in the late '80s when I spent a weekend assisting one of Australia's founding medievalists, Peter Lee. After a few trials making daggers and the odd scrap of chain mail, my interest slid to the back burner indefinitely. Recently however, my son, now eight, developed his own interest in things vaguely medieval (D&D, Warhammer etc.) and his interest has inspired me to get back into it . The first piece I made was a mail shirt and coif sized to fit my son. Though with a weight of 5.4Kg (11.9lbs) for the shirt and 1.7kgs (3.7lbs) for the coif, he never wears it for long. The little helmet in the picture is another 1kg (2.2lbs). 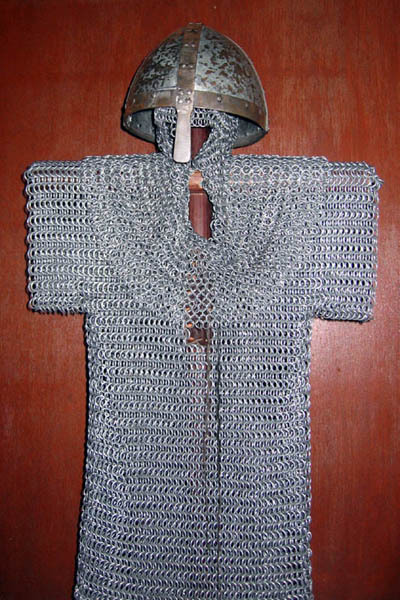 The shirt is made fro 2mm fencing wire and the coif from 1.6mm fencing wire. 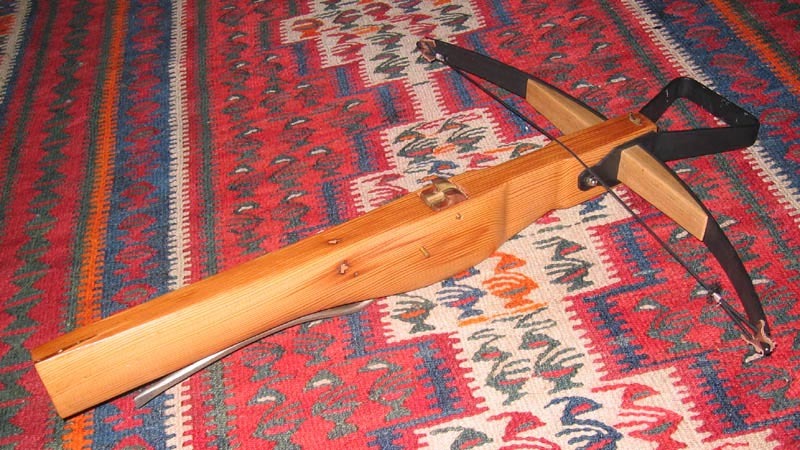 The Crossbow is also a fraction undersized and is made with a rigid prod for safety (and where I live, legality). The 'string' is elastic enabling it to fire up to about 20 feet. 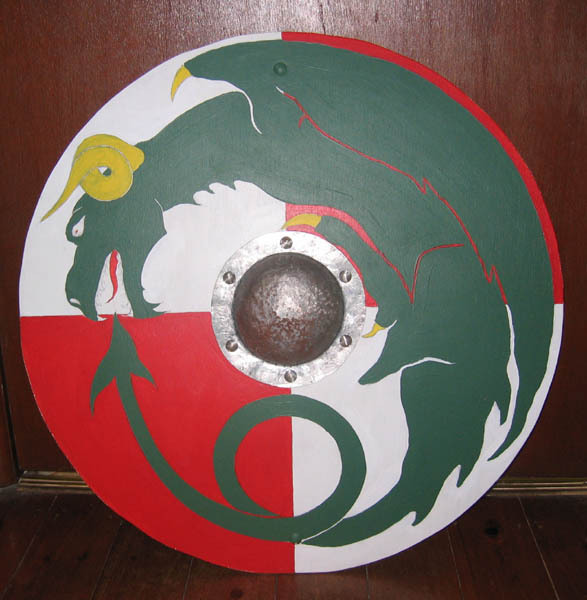 The shield (still a work in progress) is again designed for my son being made out of ply only 7mm thick for weight reasons. The boss is 18-gauge steel. Of the various swords I have attempted the two pictured are probably the better efforts. Both are made from mild steel, which started life as galvanized lintels (easy to obtain from the hardware store). 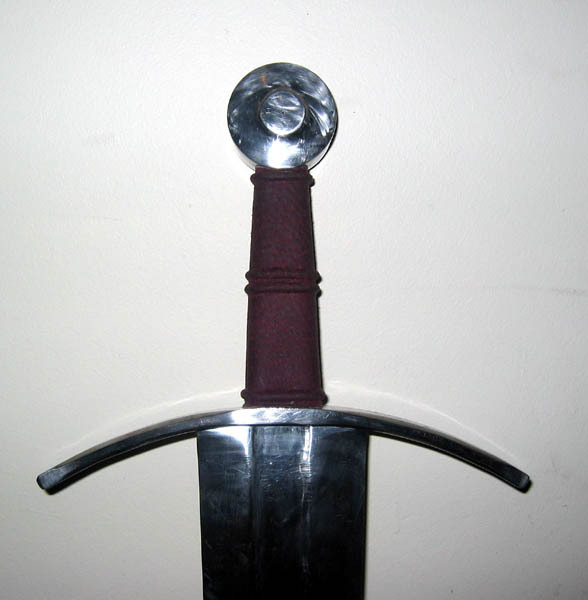 The shorter of the two (Oakeshott type XIV theoretically) has a 65cm (26") blade and a grip for which I am entirely indebted to Sean Flint and his article on redressing his English Estoc. The other has an 80cm (31") blade and is, as you can see a work in progress. Forgive, if you will the wavering of the blades as all my tools are of the hand held variety. 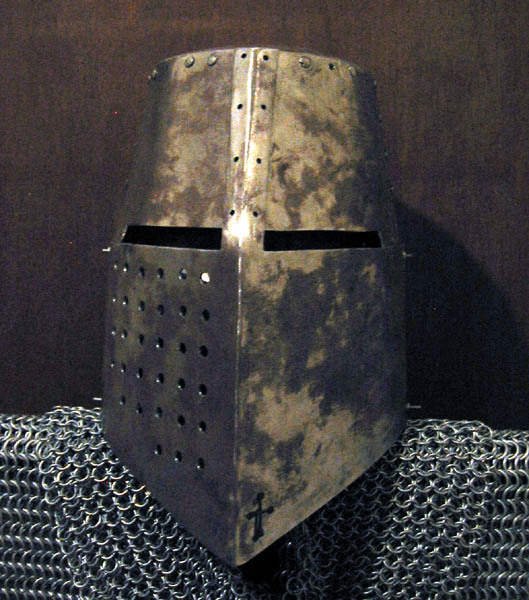 Also a work in progress is the Great Helm made from 16-gauge steel and much harder work than it looks. Really nice looking stuff ! Lucky lad, that son of yours. By the way, 7mm, isn't too thin for a shield like that. They've been reported as thin as 6mm. Nice looking stuff. You're pretty much shoo-in for coolest dad on the block. Thanks for your comments. It has to be said though, that the work has not been done solely for my son's gratification. I've just tried to make some prop swords for the Shakespeare festival at my high school, and I was using aluminum, and that was not easy for me XD , partially because they are my first attempt at forging my own weapons, and partially because the only tools I had were some tongs, a hammer, a bucket of water, some wet towels, my front porch (as my anvil) , a welding torch, and my dad, rofl. and one of my big problems was that since I had to work out side, I can't see if the metal turned red hot, some times it'll get over heated and start to melt, lol. I like the fact that you've made an obvious effort to borrow from historical designs with your swords. I've seen quite a few makers who currently produce "historic swords" that are much less pleasing to my eye because of not getting important details right. Your work is certainly a step up from a lot of the stuff out there, and you're not even trying to sell it! Nice work. In answer to your question. My swords are cut and ground from mild steel bar using a hack saw and hand held angle grinder. No banging or heating required. They started life as 1000 x 85 x 7mm lintels making them a little on the thick side which helps offset the softness of the steel but adds significantly to the weight. As theatrical props they would be way too unwieldy. You might try using an angle grinder on Aluminum, the only thing to watch for would be cutting too deep in the soft metal. Thanks for your comments. 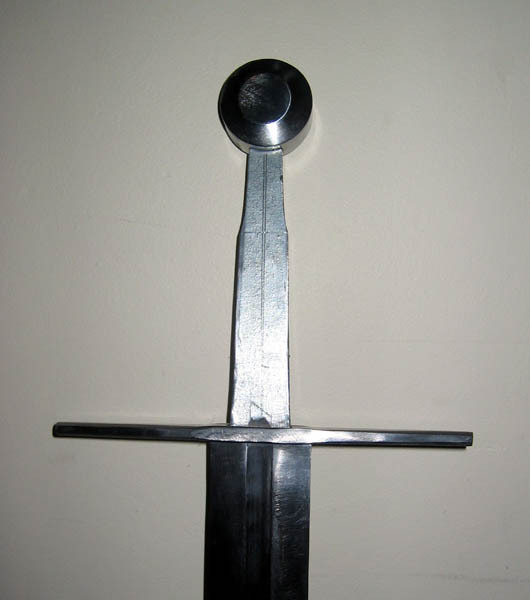 My first full size sword (not shown) was a fantasy piece highly influenced by Jody Sampson's Conan sword. Despite putting a lot of effort into the design, aesthetically, the result was less than I was hoping for. It dawned on me that following the classic lines of historical swords was going to be far more fulfilling than trying to reinvent the wheel. Well, that might be downplaying your creativity a little too far. They look like good swords.